Looking for a solution to “How can I organize my office?” Classy Closets can relieve the stress and frustration that comes with being surrounded by chaos! Our Professional Designers have years of experience in helping people find solutions to the feelings of overwhelm created by disorganization. 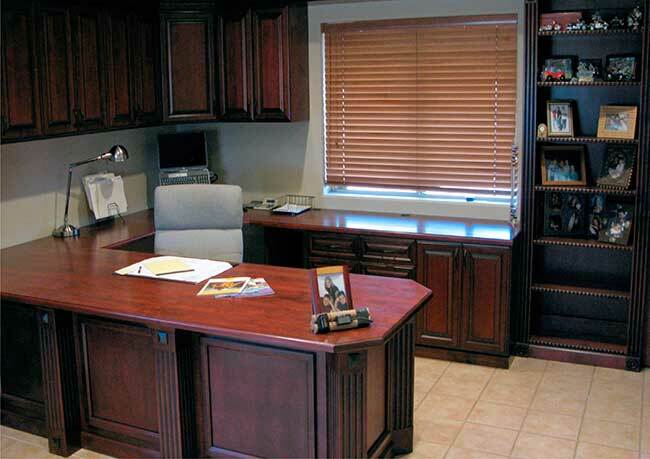 Whether you need help with a home office or your corporate office space, our Organization Experts provide customized solutions to clients in all kinds of different situations. Is your business growing and you want to make better use of the space you have verses the expense of leasing a larger space? Do you need to expand and want to match the furniture you already have verses having to purchase all new furniture? Are you working with a small space at home and don’t have anywhere to put things? 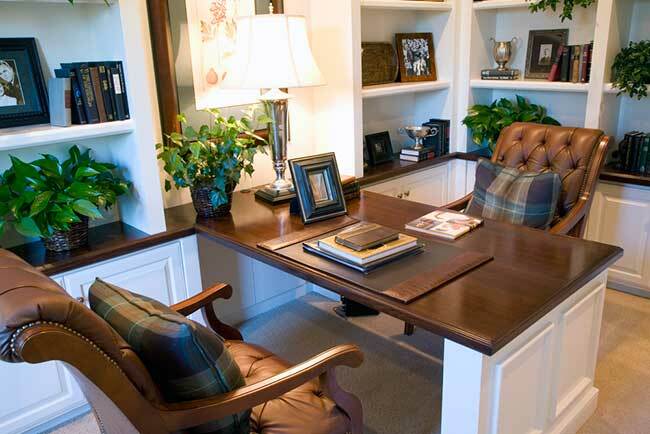 Does your home office need to double as a living room or guest bedroom? 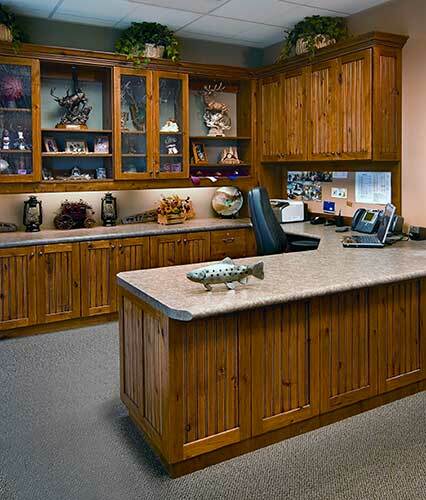 Do you have a unique style all your own that you want to incorporate into the design of your office? You might be surprised and thrilled at the functional and innovative ideas our Designers can come up with that you would have never dreamed of on your own! Our goal is to make all our Customers raving Fans by providing unique ideas and solutions, the highest quality products, and exceptional service. Don’t continue to be frustrated by procrastination! There’s no reason to hesitate calling to schedule an appointment with one of our Design Experts as it’s completely FREE to have one of our team come to your location for an in-depth analysis of your needs and how we can provide a solution! When You Want It, with a More Organized Work Space! At Classy Closets, we have solutions that are functional, attractive, and will help keep all of your important information organized and easy to find. 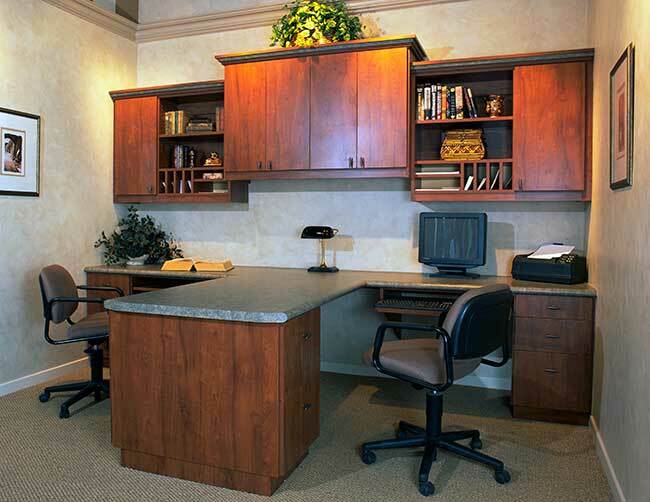 We’ll make sure your custom cabinets fit perfectly with your current office furniture as we can use the same beautiful wood, and we can match any finish and available hardware. Our Professional Designers take any space and utilize it more effectively and efficiently. 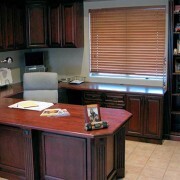 They can design new elements that can integrate seamlessly into your current office décor, or design something completely new that are a matching ensemble; computer desks, filing cabinets, bookshelves and more. 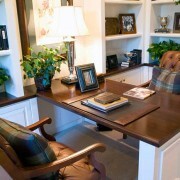 Your work desk is perhaps the most important element of your new office design. Will you primarily use it for a desktop computer, other electronic devices, reading, studying, or meeting with associates? 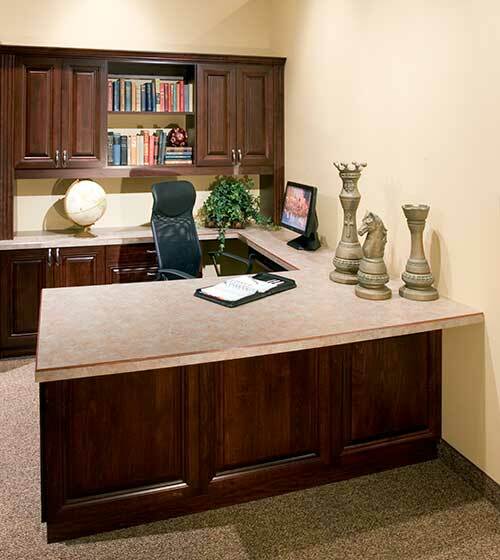 We will help you design an office desk perfect for your needs. 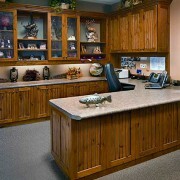 You can choose from a variety of sizes, styles and wood finishes. 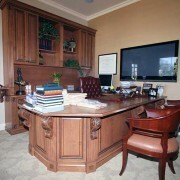 If you want a stand-alone, executive desk, we can design it. 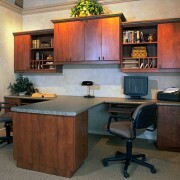 If you want a corner desk, a peninsula, or a wrap-around desk, then we can design those. 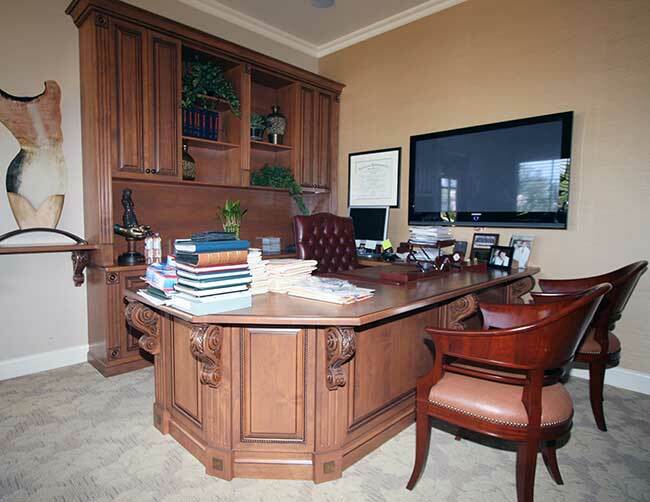 Our Experts will custom design your desk space, positioning, and organizational elements of your entire office to help you be most productive. Classy Closets can provide you with wall shelves, desk shelves, and above-desk shelving all customized and configured for your unique office space. 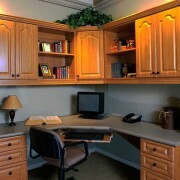 We can add matching cabinets also designed for best usage and to optimize the space you have. We can design customized floor-to-ceiling shelves, or custom traditional standing bookcases in your choice of wood and finishes. Our Professional Designers will custom design all the elements of your office to make sure they fit the size and shape of your room, the look and style you were hoping for, and at budget you set. You will never waste another minute being frustrated by not being able to find what you are searching for again. Perfect Space. Perfect Design. Perfect Functionality. Meet with your Personal Designer for FREE Today! Sometimes when we work from home we have to share our work space with other household needs & purposes. For instance; if there isn’t enough space in your home for a dedicated office, you might have to get really creative about how you are going to “multi-purpose” your space. One of the most exciting options we have available are custom designed wall units that can include Murphy Wall Beds, fold-out Desks, Tables and even Sofas… so your work space can double as a guest room, a sitting room or whatever else is most needed. Our Professional Designers can truly make magic happen… just ask them how they can do that for you! 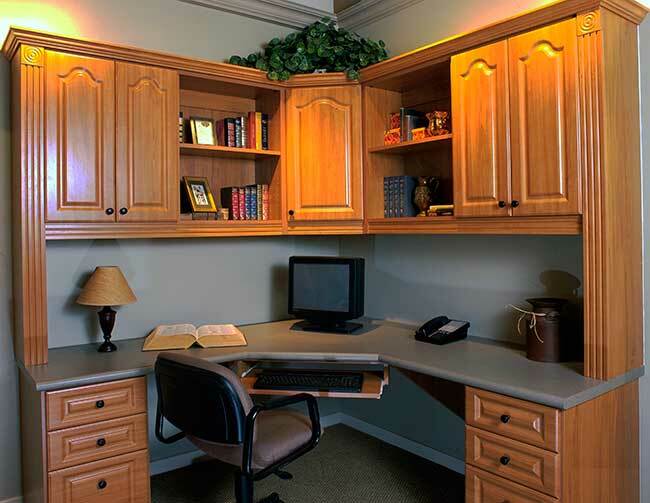 Are you torn between having a home office and a guest bedroom? 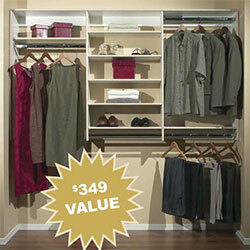 Now you can have both by incorporating one of Classy Closets’ comfortable, space-saving wall beds. A wall bed can be tucked away when it’s not needed, opening up valuable space in that room for work or play. When a guest comes to stay the night, simply pull the wall bed down from its hiding place behind tasteful cabinet doors and transform that space from office to guest room! Anything is possible!